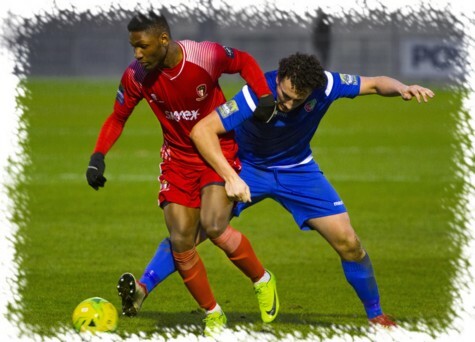 Paul Hughes' Hayes & Yeading United took advantage of their two nearest challengers drawing, sweeping aside Chalfont St Peter at the SKYex on a cold Saturday afternoon to move seven points clear of the chasing pack with two games in hand. 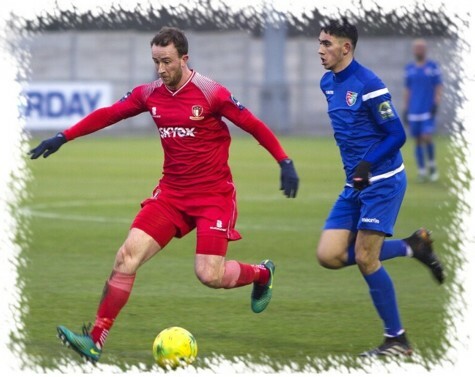 With injury depriving the gaffer of the services of Elliot Benyon, Duncan Culley returned to a starting line-up that also included newly signed Callum McAllister in midfield. 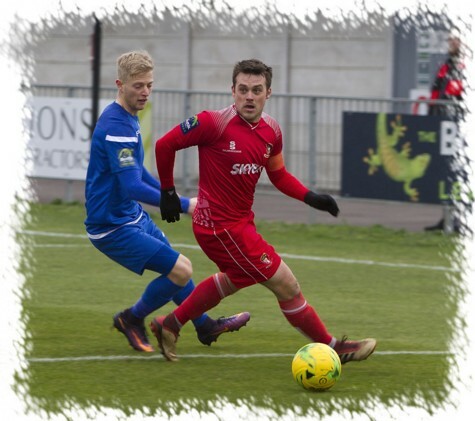 As is often the case this season, United were out of the blocks quickly and in just the third minute Toby Little curled a 25 yard free-kick around the Saints wall forcing 'keeper Carl Dennison to push the effort wide before claiming the resultant corner kick. Dennison was required again in the 11th minute, pushing wide another Little effort after the opening had been created by a nice exchange between the Scott's, Donnelly and Bridges. Little was not to be denied for long though as just four minutes later Donnelly sprayed the ball to him on the left side, Little held off the challenge of Luke Appleton before smashing the ball under Dennison who will no doubt feel he should have done better. At the midway point in the half it was not surprising that another chance came for the impressive Little. Donnelly and Bridges once again the creative force before finding Little who saw his shot deflected the wrong side of the upright. Just around the half hour mark Ed Asafu-Adjaye exchanged passes with Little and crossed to Culley, his side footed effort slipping wide of the target. Six minutes from the break Little netted his 16th of the campaign from left wing-back. Roddy Collins won possession and found Donnelly who swung the ball down the right side to Lee Barney, the striker moved easily past Mark Goodman before pulling the ball back to Little who beat Dennison with his right foot low into the corner. 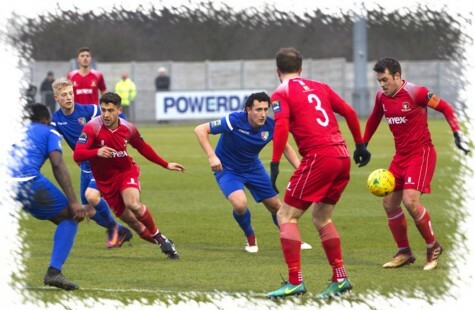 In stoppage time, and without the United goal really being troubled, The home side opened up the Saints again when Culley flicked on to Donnelly who found Little, his low shot was pushed out to a sliding Barney six yards out but his effort was wide of the target. United came out all guns blazing again after the break and took just four minutes to increase their advantage. Little, Donnelly and Barney combined before the ball was returned to Little, his cross was headed out by Adam Kirby but collected by Donnelly, the skipper taking a touch before firing low past Dennison from 20 yards out. Two minutes later Charlie Burns finally got to "warm his gloves" as Chalfont substitute Michael Kalu's shot from distance deflected into the path of Alex Paine, Hs shot from inside the box being blocked by Burns with Collins clearing up. Bridges soon went close twice, Dennison held his 20 yard effort and then a minute later a fine Callum McAllister ball down the left fed Barney who pulled the ball back to Bridges who fired inches wide of the target. A Barney cross that sailed toward goal was tipped over by Dennison and then on the hour at the other end Adam Morris collected the ball on the right side and fired the ball fiercely across the United six yard box without a touch in the middle. In the 67th minute United had four with Tom Jelley netting his first for United and the 80th league goal of the current campaign. Jelley collected the ball just outside his own area and ran through in the centre of the pitch and towards the Saints box, a little exchange with Barney on the edge of the box left saw Barney flick the ball back to Jelley through his legs and the wing-back fired past Dennison from 15 yards. Within a minute only an excellent block on the edge of the box denied United potentially a fifth. Substitute Ash Nzala received the ball from Donnelly, turned his marker only for his shot to be blocked clear by Adam Kirby. In the closing minutes Little twice went close to a hat-trick but both efforts were wide of the target, the final effort of the game came on 90 minutes when Nzala collected the ball from fellow substitute Rylan Myers, his shot on the turn being held by Dennison and at the final whistle United retained their 100% home league record and also the 100% start to 2019.